You’ve probably heard a lot about whitetail deer hunting and are curious as to what is so popular about it. For the most part, it is simply one of the most common species of deer, especially in the United States, making it a popular target for deer hunters. 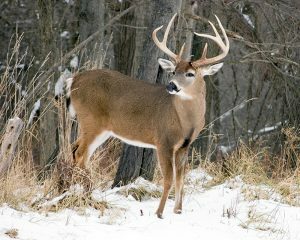 However, before you can go hunting for whitetail, you should know a little about them and their habitat so that you can target them correctly. In the Eastern half of Nebraska it is the most common species and is more profuse than mule deer even on some of the western most stream courses. The whitetail deer is the most important big game in North America and exceeds an annual harvest of three hundred thousand in several states and about twenty-eight thousand in Nebraska since 1987. The monetary impact provided by deer hunters on permits alone, amounted to $1.5 million in 1990 and about $1.2 million of this was attributed to whitetail deer hunting. The first thing you’ll notice when hunting whitetail is the reason these deer are referred to by such a name. They have a relatively long, broad tail for deer that is white on the underside (which is usually visible, due to that the tail sticks up in the air). These deer are relatively small and generally have short ears. Females do not have antlers, and the antlers on bucks have all major points coming off the main beam. On average, males weigh between 30 and 70 kilograms when full grown (60-160 pounds), with females being slightly smaller. It is most important in deer hunting to know where to find your target. You’ll do best searching hardwood areas in the south, with Texas being one of the major home states of this breed. In southeastern Texas, this is slightly adjusted due to the more mixed vegetation including or almost exclusively pines, in which whitetail can also make their homes. If you trek over to the Chisos Mountains of Texas, you’ll find that, while mule deer inhabit much of the lower foothills and bases of the mountains, whitetail deer hunting is best within the upper mountains themselves. However, in most other places, such as the Guadalupe Mountains, this is completely vice versa, with whitetails preferring the foothills. Whitetails have developed a keen sense of smell to help them avoid predation. They depend on scent but have also exceptional hearing and sight. Whitetails are less vulnerable to hunting because of their behavior and habitat preference compared to mule deer. To be successful in whitetail deer hunting, a hunter must choose a correct strategy to hunt. There are many strategies to whitetail deer hunting, but deer stand hunting is probably the most productive. You’ll notice in whitetail deer that these animals are dainty eaters and can be quite choosey in their meal tickets. In the Chisos Mountains, you would do best to target them in areas where they can feed extensively on mountain mahogany and low shrubs, while specimens in the Edwards Plateau area are more likely to graze on forbs and grass. You’ll also find that deer hunts can occur in a very concentrated area, since these deer have a small home range and wont stray far from it, especially where food is abundant. In fact, some marked whitetails have been noted to spend at least three years inhabiting less 600 acres. Deer stand hunting strategy for whitetail deer hunting avoids detection by sitting motionless and avoiding movements. If the hunters play it right, they will be scent free making them the most lethal hunter when it comes to deer hunting. A huge factor for a hunter’s success is playing the wind and his location, a downwind or a crosswind location is custom made for a stand hunter in steering clear of the deer’s sensitive nose. The right location is everything, and knowing them can lead to a successful whitetail deer hunting. Good locations are trails, primary food sources, saddles, funnels, edge habitats, and benches, with each having its own advantage and set of rules for hunting successfully. Trails are a big factor, bends in the trails are excellent places to trap whitetails. Picking the side of the trail where the wind is in your favor and having the lanes cut so you stay clear and clean to get a shot off. Primary food sources are where you can find the deer feeding. Find these areas in advance, there will be a trail that leads from the bedding area to the food source. The best morning stand will be near the bedding area and the evening stand would be near the field. Saddles are good areas to trap a deer because they like to travel ridges while still using cover. These deer hunting areas are often times used by the deer as escape routes during times of heavy hunting pressure. Funnels are active areas for whitetails during the season of hunting, as hunting pressures can keep the deer moving all throughout the day through these areas. Edge Habitat is a prime area for whitetails to move along Set up a stand up on the edge of fields if it’s an evening hunt where deer may be feeding. When hunting during the morning or the middle of the day, set the stand up near the deer’s bedding area but not too close or he may move from the area all together. Benches are shelves that lie just below a ridge top and are the best places for a deer to feed, bed, and make scrapes. When on whitetail deer hunting, always remember to play the wind and always have clear shooting lanes prepared. Playing your cards right will always result to a successful deer hunting. Once you’ve determined what you are looking for and where you are going to be able to find it, you can make a success of your whitetail deer hunting trip with ease. Following these guidelines will make your trip enjoyable and fruitful.